Where our designer, lifestyle, super luxury spaces are carefully re-defined to enhance your aspirations. Take a detour from the ordinary to find the perfect residence worthy of a distinguished personality like you. Discover unparalleled and exemplary craftsmanship on all fronts from amenities to actuals in each and every single 24K project for we draw our inspiration from none other than the Golden Ratio popularized by the legendary architect Le Corbusier. 24K Opula offers exclusive 4 Rooms, Living & Kitchen spaces with opulent sundecks. Each home is built to perfection and adheres to the highest standards of quality & efficiency. The rich 24K lifestyle offers a plethora of amenities & features to make your home a dream come true. Kolte Patil 24K Atria project comprises of all features that a contemporary home buyer would wish to have. It is a part of the suburban area of Pimple Nilakh. The facilities within the project are elegantly crafted. Glitterati is an architectural masterpiece that offers excellent landscaping, ultra-modern amenities, ample open spaces and stunning designs. The elegantly designed facades render a unique Spanish overtone to the towers. Located at Pimple-Nilakh, Glitterati II features limited-edition, 2 and 3 Bedroom apartments, designed for young conquerors. 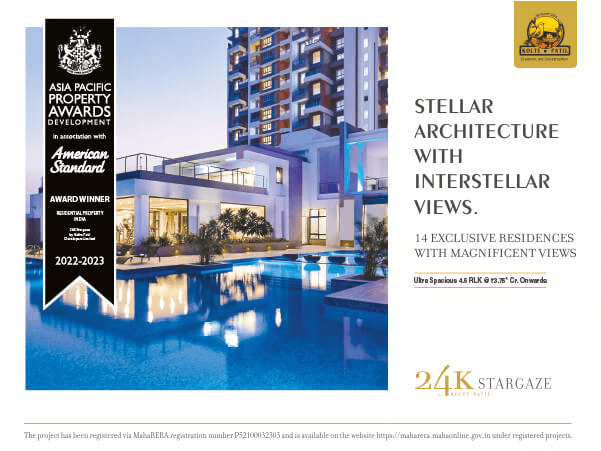 In terms of features and lifestyle, it is evidently the next level of 24K.